College have to work on their infrastructure , i personally like the new building in the college and the ground . college have to start different programmes to encourage the students and gain their interest . At last I would summarise my college as a temple of knowledge with trust , patience .I love my college culture events, study background.Our college management strikes a great balance. DAV College was the just college in Dehradun prior for PG education earlier than the growth of private institutions. The College provides huge number of Post graduation and under graduation Courses. There has been a lengthy magnificent record of the college in diverse programmes such as games, sports, Adult Education, Rangers, NSS and NCC etc. The institute has produced well-known personalities who have completed their mark in special fields in Abroad and India. Still this college is expanding in the mode of expansion and informing numbers of scholars each year. 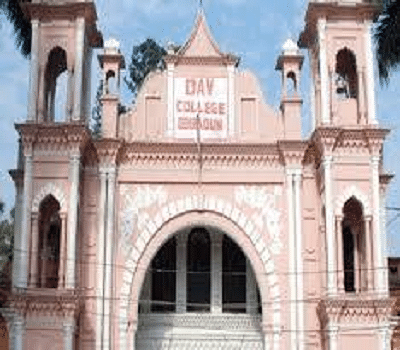 In its ride through years, DAV (PG) College is in edge of alteration time when the world is lessening and hard the new requirements of the current time. This important organization is all set to preserve the balance among perfect glory and the entire required changes. HNB Garhwal University, Srinagar, Uttarakhand. Why to Join DAV PG College? Library: The library is a pool of knowledge of print material. This College has a wonderful collection of over 1.75 Lacs books on the subject matter provided by the University or College that is being modernized on normal intervals. Aside from that knowledge enhancement books, preparation for competitive examination, lifelong learning also add to the group. Reading Room: A large hall for reading with the 100 readers seating capacity is the best part of building. This college offer conductive ambiance to the students for study. It is reserved open for long time throughout the time of exam. Placement: The placement and career guidance cell of the college is vigorously busy in arranging workshops, seminars and interview to make stronger the employability of their students. It takes proper care of revealing placement brochures and providing them to presumed organizations to carry out session of interviews. For M. come admission last date please?? And how much percentage is need? Hi Abhishek, for the merit list, you may contact the College.